ThermoViewer 2.0. Enabling commercial thermal drone operations. With the launch of its new dual RGB/thermal camera ThermalCapture Fusion (read press release), TeAx Technology just announced its latest software upgrade for ThermoViewer, the brand new version 2.0. The free software provides a straight forward approach for post-processing of stored thermal data based on ThermalCapture products. 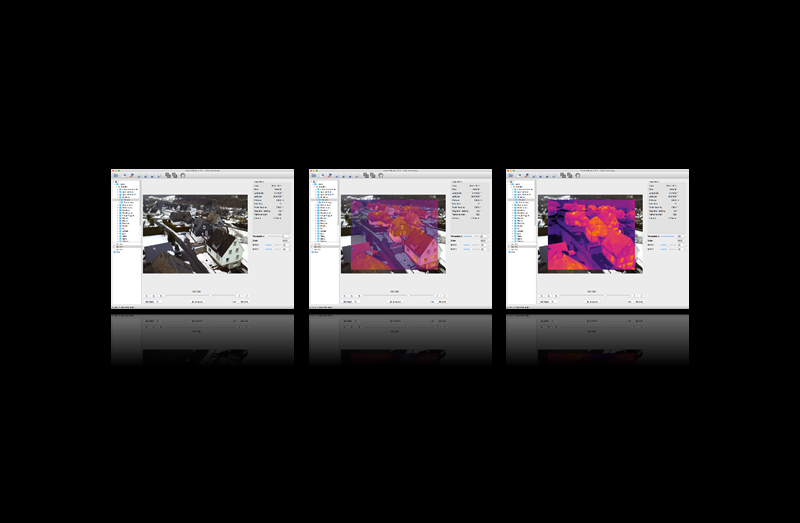 With the software version 2.0 now being available, ThermoViewer is capable of post-processing fully aligned RGB and thermal raw data – out of one file only. It never has been any easier and less time consuming for operators within thermal business. Just import your data, run temperature measurements per pixel (or other analyzes) and finally export relevant data to your report. And whenever you need to run even more extensive thermal analyses, benefit from ThermoViewers unique interface to FLIR Tools and just do it, seamlessly. ThermoViewer is compatible with ThermalCapture Fusion and ThermalCapture 2.0 hardware. Apart from the fact that the software is freely available, clients also benefit from new features being released continuously over time. And since TeAx is the sole developing company behind it, every feature request from clients is being considered and usually implemented – for the benefit of all global customers. Export to many popular file formats for further post-processing. If one format is missing, we can add it.